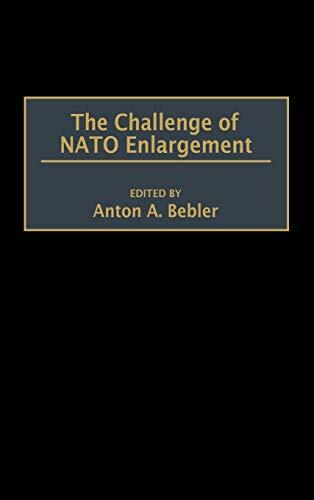 The Challenge Of Nato Enlargement: 9780275961084 Hardcover - LIMEROCK BOOKS INC.
Twenty-six key officials and experts analyze the NATO decision to expand into Central-Eastern Europe. Contributors include the NATO Secretary General Solana, President Clinton, former Soviet leader Gorbachev, former Supreme Allied Commander in Europe Joulwan, several active and former foreign ministers and deputy foreign ministers, other high officials, and prominent academics from the United States and Europe. Particular attention is paid to the rationale, pros and cons, and the impact on Russia, Ukraine, the European neutrals, the new NATO members, and the remaining hopefuls. The volume begins by presenting the offical NATO explanation of the 1997 decision to expand into Central-Eastern Europe and examines the problems the decisions might well create. Next are essays providing a critique of the decision, mainly from the standpoint of the West's future relations with Russia. Polish, Czech, and Hungarian officals then describe their countries' positions and expectations as new NATO members, after which the credentials of six candidates for the next round of NATO enlargement are analyzed. After discussing the impact of NATO enlargement on the European neutrals and the Nordic states, the volume concludes with a presentation of major arguments for and against the enlargement and the known or presumed motivations of the main actors related to NATO enlargement. Examines the impact of NATO expansion into Central-Eastern Europe.